As long as I've known my adored, talented writer/English professor/DJ friend Jason Tougaw (we met in Mexico six years ago under extremely funny circumstances and have remained friends ever since), I've known about his grandfather, Ralph Neves. 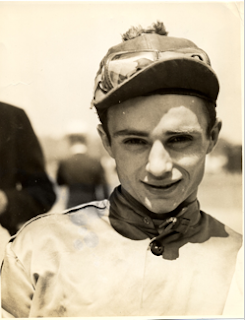 Neves was a jockey, 4'9" and "dominated any room he inhabited". Hot-blooded and fast-living – nicknamed the Portuguese Pepperpot – he hung out with all the Hollywood celebrities of the day. He started riding at 13, after he ran away from a Catholic school for orphans, where he landed when his father was institutionalised for schizophrenia, and found his way to a horse ranch in Oregon. He was ruthless on the track. In life, he was as charming as he was callous, writes Tougaw. One day in 1936, he came back from the dead. You can read Jason's piece about that amazing day here. Enjoy.